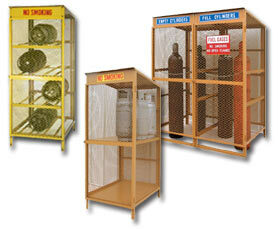 Tamper-proof cabinets are designed to prevent cylinders from jarring. Easy-swing hinged doors feature padlock clasp. Features reinforced wall panels -- 16 ga. flat expanded metal with 3/4" openings. Roof is 18 ga. steel. Angle iron frame and shelving -- 12 ga. reinforced shelving on 12V. Drop hinged door -- hasp for padlock. Rear protection against cylinder slamming. Meets OSHA and NFPA Requirements. (OSHA 1910-110, NFPA 58-79). Shipped KD. Crated with simple assembly. Finished in safety yellow. FOB Shipping Point. Model HCHV provides horizontal storage of eight (8) 20, 30 and 43 lb. cylinders on left side and vertical storage of approx. nine (9) fuel gas cylinders on the right side. Model HCVVprovides horizontal storage of twelve (12) 20, 30 and 43 lb. cylinders on left side and vertical storage of approx. nine (9) fuel gas cylinders on the right side. Decals...H model features "No Smoking" decal. V models have "Empty Cylinders" & "Full Cylinders" decals. V-S models have "Fuel Gases", "No Smoking", "No Open Flames" decals. 2V model has "No-Smoking" decal.